The No Ordinary World blog’s goal is to communicate science in an interesting and educational way to the public and foster awareness of and raise funds for endangered species. We strive to make science more readily accessible to the public while providing accurate and informative insights into the animal world. We love the natural world and want to show you how you can too! Where do bees get their buzz? No, I’m not referring to the sound their vibrating wings make when they fly. In fact, I’m talking about a much more colloquial “buzz” – the one you get from caffeine when you drink a cup of coffee. 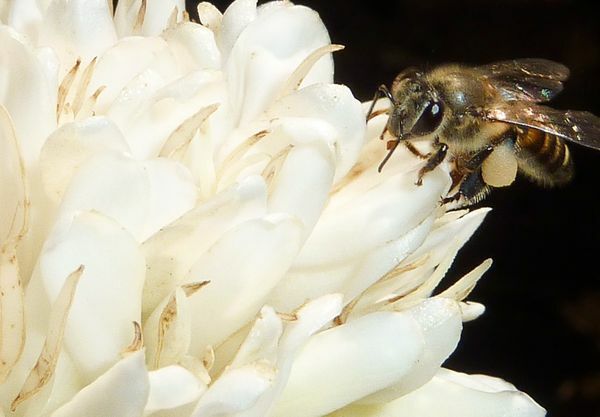 It turns out bees also enjoy the little boost in energy they reap from coffee plants when they drink the nectar, which contains low levels of caffeine that the pollinators obtain much satisfaction from. Plants originally evolved caffeine as a defense against herbivory because it can be toxic at high levels. However, at low levels, it encourages honeybees to return to the plant – thus increasing the plant’s pollination efficacy – because the honeybees’ learning and memory abilities are enhanced, and therefore the honeybee reaps a benefit from the plant. So what began as a deterrent for herbivores is now a triple whammy for the plant, which now 1) attracts more bees because the bee enjoys the caffeine buzz, 2) ensures the bee will return because its learning and memory are enhanced due to the caffeine, and 3) repels herbivores at the same time!